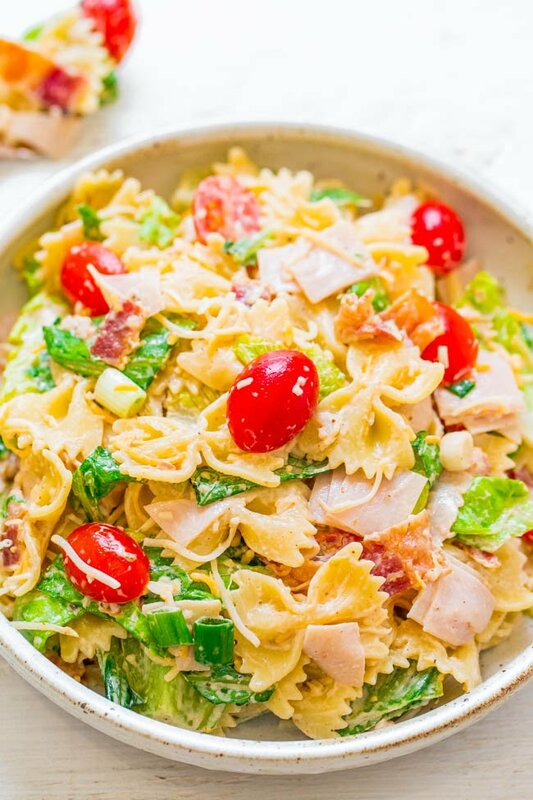 Club Sandwich Pasta Salad – All your favorite club sandwich ingredients in an EASY pasta salad!! Turkey, bacon, tomatoes, lettuce, and cheese with ranch! Ready in 15 minutes and perfect for potlucks, picnics, and parties!! I have fond memories of going out to lunch with my grandma when I was growing up. At the local diner we went to, one or both of us would usually order a club sandwich. It was just our thing. 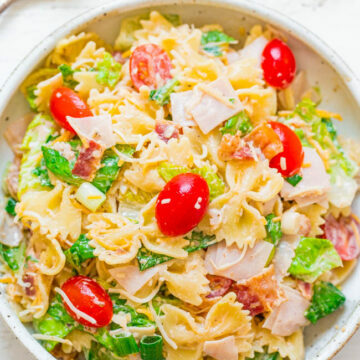 This pasta salad is a spin on a club sandwich. Turkey, bacon, tomatoes, lettuce, and cheese all coated in creamy ranch dressing that’s spiked with a hint of barbecue sauce. Nothing fancy but club sandwiches aren’t fancy – but they are definitely good. 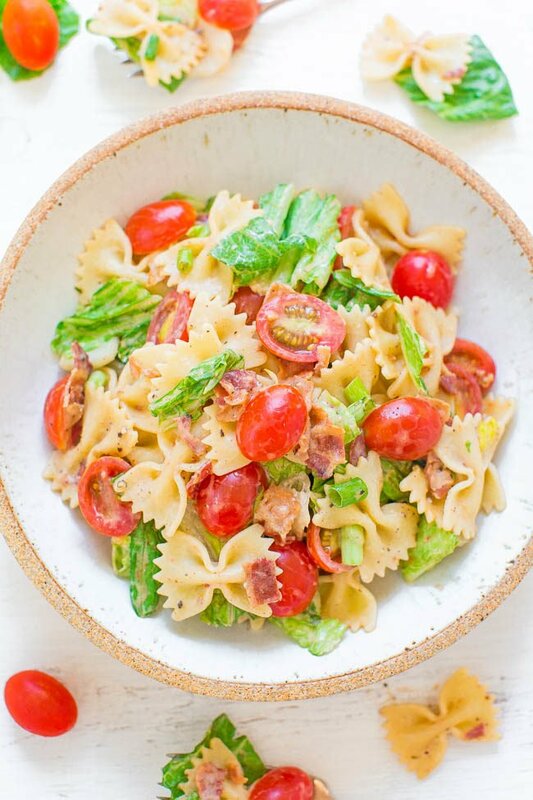 It’s a spinoff of this BLT Pasta Salad I made last summer that turned out to be a reader favorite. This is an extremely flexible recipe and you can easily add what you prefer most. Like more cheese? Add it. Are you a tomato fiend like me? Add another handful. It makes a good sized batch already but if you’re feeding a big group, it’s an easy recipe to double and will be a guaranteed crowd pleaser. You can even bump up the amount of pasta from 8 ounces to 12 ounces if you want to bulk up the batch size if you’re making this for a crowd. 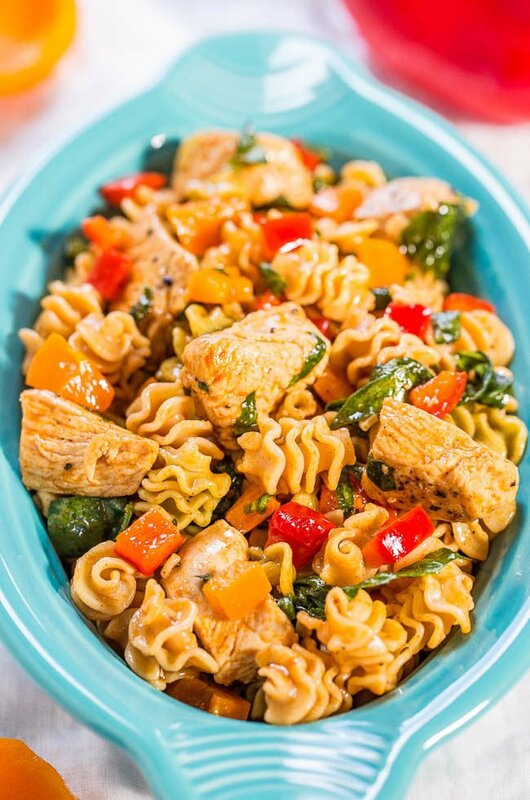 It’s easy, ready in 15 minutes, perfect for picnics, potlucks, parties, or easy-breezy lunches and dinners. I can’t believe Fourth Of July is right around the corner. 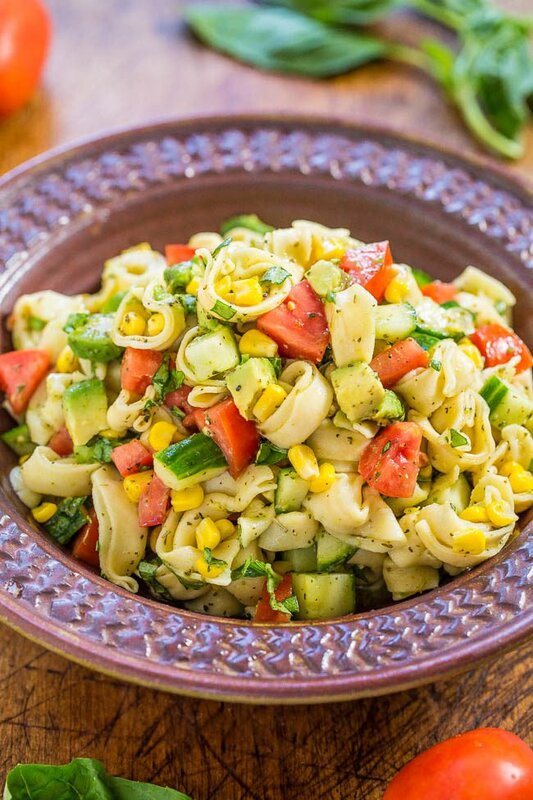 This would be a perfect pasta salad to put on your menu. 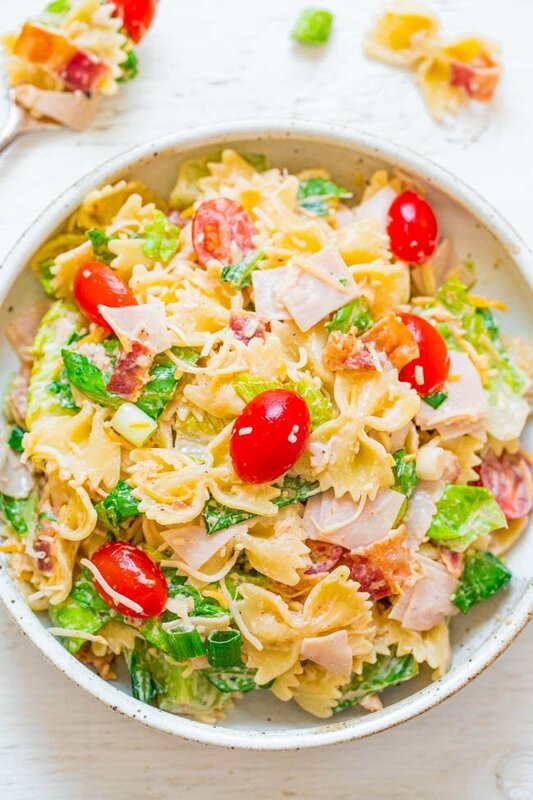 BLT Pasta Salad – EASY, ready in 15 minutes, feeds a crowd, and perfect for potlucks and parties! 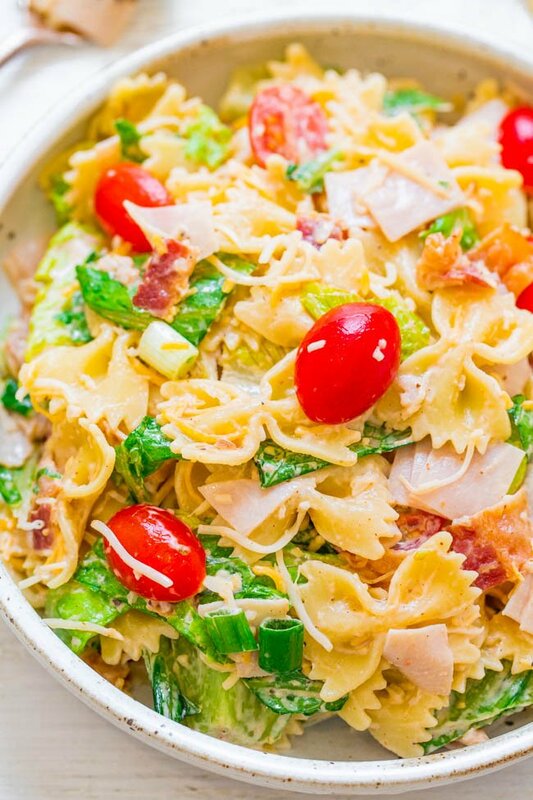 Creamy ranch dressing perfectly coats the pasta and bacon! Guaranteed family favorite! 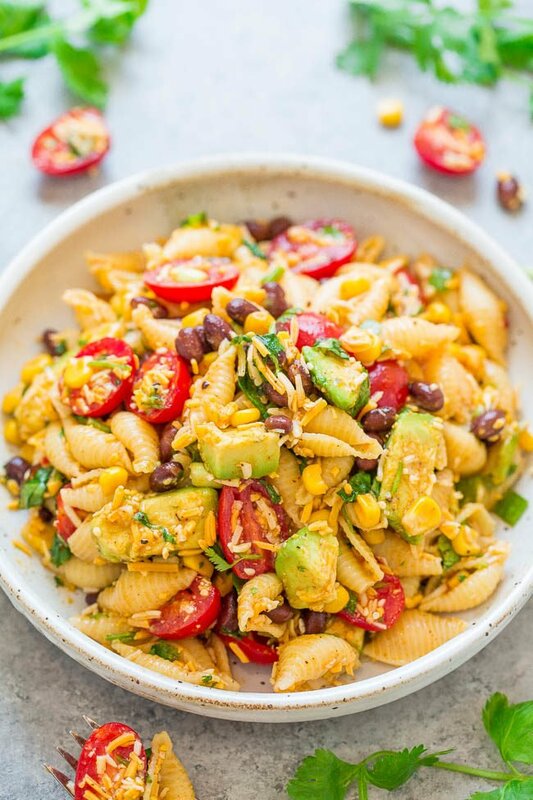 Taco Pasta Salad – Easy, ready in 20 minutes, and loaded with great Mexican-inspired ingredients including corn, black beans, tomatoes, cilantro, avocado, and more! Perfect for picnics, parties, and potlucks! Cook pasta according to package directions, drain, and add to a large bowl. Add the lettuce, tomatoes, bacon, turkey, cheese, green onions, and toss to combine; set aside. To a small bowl, add the ranch dressing, barbecue sauce, pepper, stir to combine, and evenly drizzle over the salad. If necessary, add additional ranch as desired to evenly coat the salad. Serve immediately after dressed. Salad is best fresh. 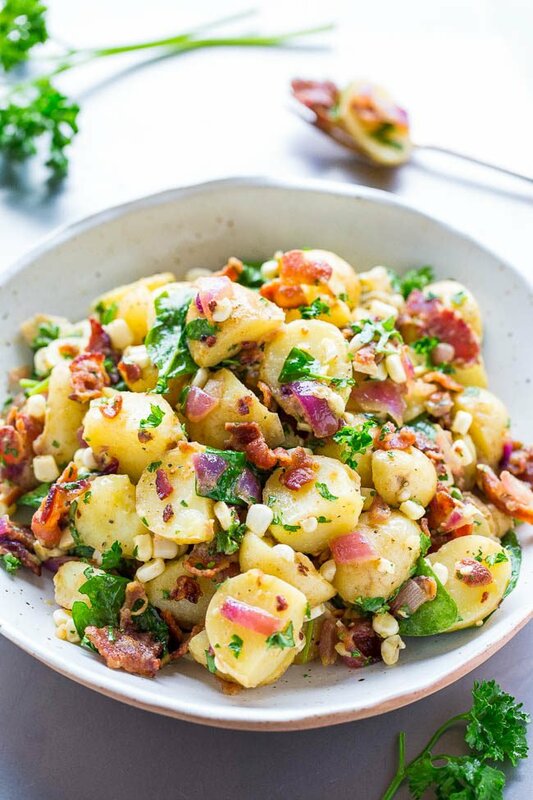 Bacon Potato Salad – There’s no mayo in this easy potato salad that’s loaded with bacon, corn, red onions, and tossed with a flavorful dijon dressing! Always a favorite at picnics, potlucks, parties, and events! 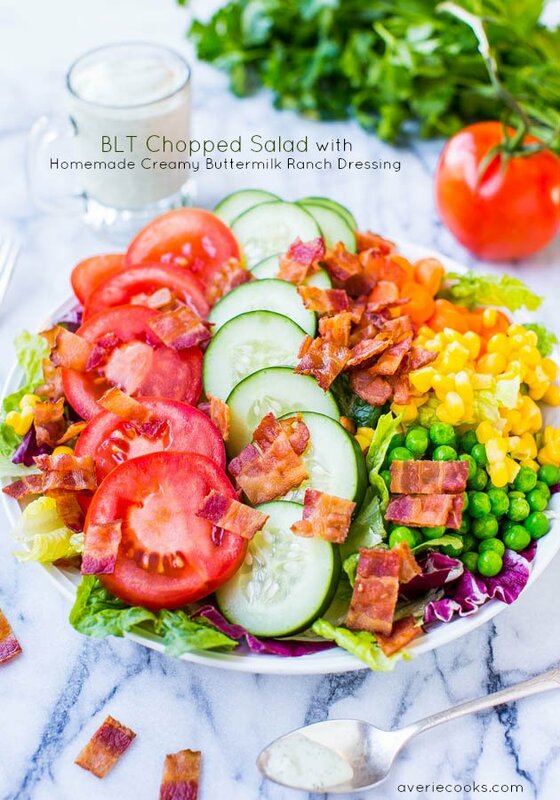 Looks good and I especially like the ranch with barbecue sauce mixed in for the dressing! It’s adds the perfect amount of flavor! That’s easy! Wonderful! This is the recipe I love! 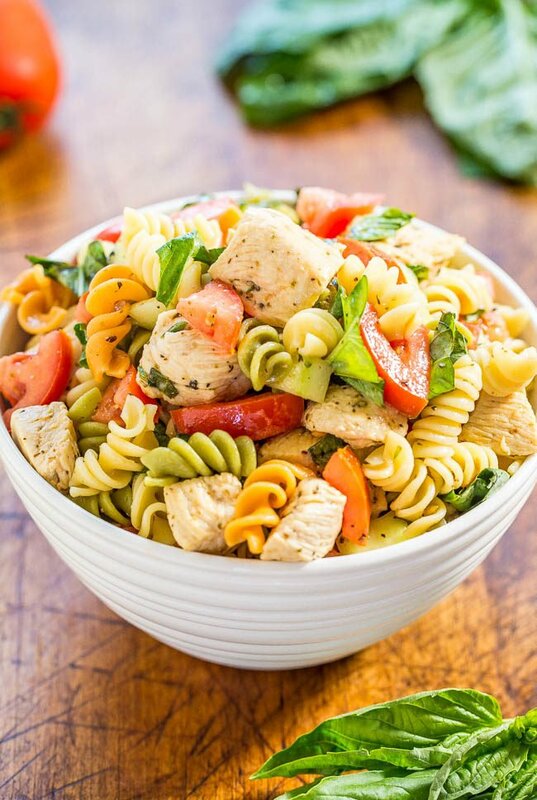 Pasta salad is all I am craving right now! So easy! This club sandwich version sounds crazy delicious! I love pasta salads and have several recipes on my blog, but this is a combo I don’t have. It sounds delicious! I’m going to make this salad, but I just want to double check the nutrition info. Can’t believe that the counts are so low. Just what I need to slow down a hungry lunch appetite. If you yield 10 servings out of the batch, yes that is the approximate estimate based on an automated tool. As always, do your own math if it’s of utmost importance to your health. I would like to pin your recipes but I don’t have that option available. I don’t have a printer either. I would love to have access to your recipes without having to search your pinterest page. Is there another option available?. There is a hoovering pin button on the top left corner of all photos. Create a free Pinterest account and save to that. Or copy/paste the recipe to yourself in an email. hey girl- this salad looks so yummy! Right up my alley! It’s going to be 99 degrees this weekend. I’m making this for dinner.